Before I tell you where that quote came from and what the connection is to the Gordon Commission, I want to go back in time first. I did what I frequently do when presented with troubling declarations of plans that I know will come to a poor end. I went back to someone who dealt with comparable aspirations and ideologies for insights into what is really going on and how this might end. History is much more reliable than a crystal ball. And, unlike the Marxist historians active in Europe before World War I and the 1920s, I do not use historical research as a “means of political agitation.” I will confess though it can be more useful than espresso as a jolting wakeup call. No, I am not that ancient except to my kids but I did go back to someone who lived through what happened in Europe in the early 20th century and presciently recognized the gravity of what he was looking at. Economist Ludwig Von Mises saw that history and political theories were being used all around him “to provide weapons against the hated bourgeois order of society.” Remember that quote when we get to the end of this post. Von Mises was infatuated with socialism when he was younger, like most German and Austrian intellectuals of that time. But he wrote the book Socialism to explain why he believed it would not work. Long before Communism had crashed and burned in the USSR or the Germans tried out a more Corporatist and Nationalist version of socialism that launched 2 world wars. I wanted his insights into why planning societies does not work from what he saw in real time. The book was originally published in German in 1932 so Von Mises is speaking from quite a unique vantage point. What I hit upon instead was so on point with using education to shut down the abstract mind and push action instead. Plus the desire we keep encountering to supply the interpretive concepts and metaphors, instead of accurate facts, to filter student’s daily reality. I decided we could use Von Mises’s observations from so long ago. Von Mises goes on in a footnote to clarify that “the wish is the father of faith.” Faith is thus what all these education reforms are really trying to create. Do you remember this post http://www.invisibleserfscollar.com/excellence-means-education-putting-what-we-feel-wish-for-and-think-in-harmony/ where influential Harvard psychology prof Mihaly Csiksentmihalyi laid out his vision of the Flow experience? As Von Mises ably observed in dealing with earlier “Let’s Remake the World Schemers,” there is no abstract thought when wish for and feeling are joined to thought. It is the sort of cultivated personality ready to attend and celebrate at rallies without a second thought. Csik’s Flow and the idea of physical activity in a digital environment instead of mental is mentioned throughout this new view of curriculum and assessment we started to look at in the last post. A primary solution for engaging students at school and keeping them in school is Gaming. As in video games. That really caught my interest for several reasons. I know the Gates Foundation has been funding it for the Common Core implementation. I know that Professor James Paul Gee, who we discovered in this post http://www.invisibleserfscollar.com/we-are-at-the-historical-stage-for-the-emergence-of-one-particular-new-kind-of-person/ does not believe in the concept of discrete individuals, has pivoted in the last 10 years in his education research to focusing on gaming. And I know that Amplify has been hyping Zombie-Based Apocalypse simulations as learning on its website. To get to what Joel Klein has called “new kinds of minds” I suppose. So Pearson and the Gordon Commission and everyone else is pushing Gaming. And Gee who wants education to help create people to be “better modules in a distributed non-authoritarian system” is both a member of the Commission and pushing Gaming instead of linguistic mischief making. His previous research mission. Although if you look up his report “Good Video Games and Good Learning” you will see he is quite excited that Gaming helps move education beyond its fetish with print and words. Important to the schemers as we now know. What do they mean by Gaming? As we saw with the Zombie Apocalypse simulation story that cited sources acknowledging that this type of digital learning is known to weaken the mind http://www.invisibleserfscollar.com/creating-new-minds-different-values-equity-in-credentials-can-this-really-lead-us-to-prosperity/ , the point of the simulations described is to practice planning and redesigning societies. You can see why I went back to Von Mises. So the same report that starts off maligning knowledge of facts as “banking education” wants students to practice reimagining other ways for societies to exist and to come to believe that societies can be planned. And the games cited are multi-user to get both social interaction and collaboration practice. Cited are the game River City where the students learn to solve a simulated 19th century city’s problems. At least in the virtual world with the provided, controlled variables. A difference from the real world that is not likely to be pointed out to the students or the teachers. Then there is the “epistemic game called Urban Science that mimics the professional practicum experiences of urban planners.” Yes, because they are noted for doing a bang-up job with planning in the real world. Let’s ignore that and go with Professor Don Schon’s aspirations for cities and people to be systems that can be treated as problems to be solved. The virtual world awaits and the students immersed in such Gaming are likely to soon accept social and economic planning and fiats as a norm. The title of this post is quoted from the Introduction to Multiliteracies: Literacy Learning and the Design of Social Futures and it was too consistent with the aspirations of the Gaming emphasis not to use. Plus Gee and Courtney Cazden of the Discourse Classroom that we met in the Community of Learners post were both contributors. In fact Gee acknowledged that all these education reforms are to “change the game, that is, to change our society” to what he called a distributed economic system. You may have noticed all the focus on cities and urban education above and in Edmund Gordon’s mission as a professor. Likewise there are increasingly stories about students being told to learn about White Privilege or their “economic class.” This week’s version involved Americorps workers in Wisconsin but the reports are increasing around the US. So I want to close this post and set up the next one with another quote from Gee’s “New People in New Worlds” essay from the book. How succinct was that admission of the essence of what we are dealing with? Can an Education Degree Authorize Bait and Switch Political Insurrections With No Recourse? No I am not talking about a car loan. And I am also not picking on teachers. Truthfully we could substitute a psychology, sociology, anthropology, or even a legal degree in the place of the education degree. The very important point to recognize is this: can education credentials empower people to disregard the language of the US Constitution or comparable legal protections in other countries? Because right now all over the world we have colleges and universities creating degree programs that are designed to use educational institutions to change mindsets and values and beliefs and attitudes and feelings of the students passing through. Higher ed and K-12. Soon to be preschool. A long time to be under organized assault with data being gathered on your current personal attributes. All while getting paid with taxpayer funds. And the reports they are issuing if you know where to look state or cite to quotes like this: “we support the development of a revolutionary socialist movement in the United States.” As taxpayers are we bound to support that agenda as long as the person pursuing it has the right kind of education credentials? Is there really nothing we can do? You can say vote them out of office but many with this desire are tenured profs or appointed bureaucrats. 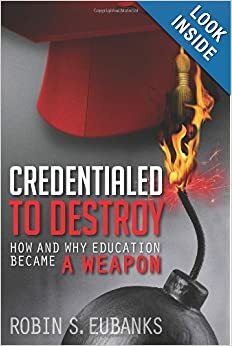 That inflammatory quote came from Samuel Bowles and Herbert Gintis’ Schooling in Capitalist America: Educational Reform and the Contradictions of Economic Life that I have already mentioned in a previous post. So when one of the reports this week from the Gordon Commission on the Future of Assessment in Education cited that book, I knew exactly what economic vision went with their vision of fairness and a just society for all in the 21st century. The Gordon Commission is largely out of sight since it was set up by Educators Testing Service in Princeton using grants made to them. But out of sight does not mean not influential. Not with the movers and shakers selected for that Commission and their connections to the actual Common Core implementation and education globally. And these reports have an explicit economic and political vision attached to them. And cites to people with notorious philosophies like Michel Foucault. Are we all just screwed because these people are education professors or evaluators or vendors and that means a free pass? Now isn’t that just the mentality you want in people developing the tasks and problems used to assess students? Oh, I forgot. The 2 authors, John T Behrens and Kristen E DiCerbo, now work for Pearson. You know the global publishing giant so involved in developing the Common Core curricula and the assessment administrator for Texas’ STAAR as well as both CCSSI consortia, SBAC and PARCC? http://www.invisibleserfscollar.com/mandating-global-citizenship-mindsets-by-assessing-whether-students-adopt-social-altruism/ talks about how Pearson’s Chief Education Advisor, Michael Barber, once advised UK citizens that Global Citizenship could replace God and Marx as a guiding value. Is it a conflict yet to be involved with all these assessments and having employees writing alarming reports for the Gordon Commission? What if the employees also write that assessments are “complex performances parallel to those learners would complete in the real world?” Sure sounds vocational to me. Especially with that report stating we are shifting from the Item Paradigm, which had questions with correct or wrong answers and sought particular information, to the Activity Paradigm. In the Activity Paradigm the assessment is not for particular information but rather an interest in “assessing specific attributes of an individual.” I feel so much better. Especially after a search of the authors’ names brought me to the website of the Journal of Educational Data Mining. No more need to stress over hypotheticals involving education’s collection of Big Data on students. We appear to be there. How lucrative for Pearson. Is it publicly traded? Can we all cash in on this connected boondoggle? Precisely what data will come from assessments involving “activities” that “request action,” “have features.” “provide attributes, ” and “provide multi-dimensional information”? In other words, it’s not what a student knows but the essence of who they are being assessed while the student is a captive in a K-12 institution. Seriously no need to worry about the fact that “digital devices of all kinds are typically enabled to collect data in ubliquitous and unobtrusive ways.” After all it was a different Gordon Commission report that pointed out that “Practices of assessment do not so much reflect the nature of the individual as they construct the individual in their terms.” Gulp. Did you understand that aspect of the Common Core? Is that what educational institutions in a free country are empowered to do while lying to the public about the nature of the changes? You may want to take another look at the nature of these performance assessments and Pearson’s confession that they are really assessing 21st century skills. http://www.invisibleserfscollar.com/throwing-an-invisibility-cloak-over-the-classroom-to-get-to-deweys-participatory-social-inquiry/ . Behrens and DiCerbo also mention they are assessing 21st century skills. That implied promise so many are relying is the Education Gospel. It in turn requires what the authors call the Foundational State–the kind of reinvented workplace we have already seen Peter Senge’s Fieldbook and Zuboff’s Support Economy pitch as an intrinsic component of all these ed reforms. The prerogatives of employers and students and parents supposedly just have to be subordinated to the needs of the Foundational State. Which, 1, 2, 3 “requires a very different approach to politics and democracy than we have now. It provides a clear vision of the common good: a society in which human capacities are consistently and equitably developed.” Which is a good summary of Marx’s human development theory. Back for its 21st century run on the Industrialized West via stealth and education and apparently poorly understood assessments. And I say, amen to that. The Swedes said basically the same thing when they piloted these ed reforms as part of their move to the Welfare State in the 1950s and 60s. You cannot unlink the actual Common Core implementation from the radical political, social, and economic changes that are essential components. Everyone consistently says so if you know where to look. I know where to look and have. Already downloaded and hard copied. Can we get enough parents and taxpayers and politicians to listen in time?